BTC/USD has stuck in a narrow range, capped by $6,400. Investment tycoon has set a working group to to see if cryptos has a potential. Bitcoin, the largest digital currency by market value, is changing hands at $6,357. The coin touched $6,385 on Sunday, but failed to progress any higher since that time. While the downside momentum is not so active during Asian hours, the end of the working week might bring in some volatility to the cryptocurrency market. Meanwhile, investors from the parallel world of traditional finances continue exploring the opportunities offered by digital assets. Thus, BlackRock, the world's largest asset manager, has created a working group to investigate the benefits of cryptocurrency market. BlackRock is a prestigious financial institution with an established reputation. Its interest in Bitcoin and other virtual coins could be a turning point cryptocurrency legitimizing and mass adoption. BlackRock is going to publish its financial data on Monday, July 16. The revenues are forecasted to increase over 21% for fiscal quarter ending on June 2018. 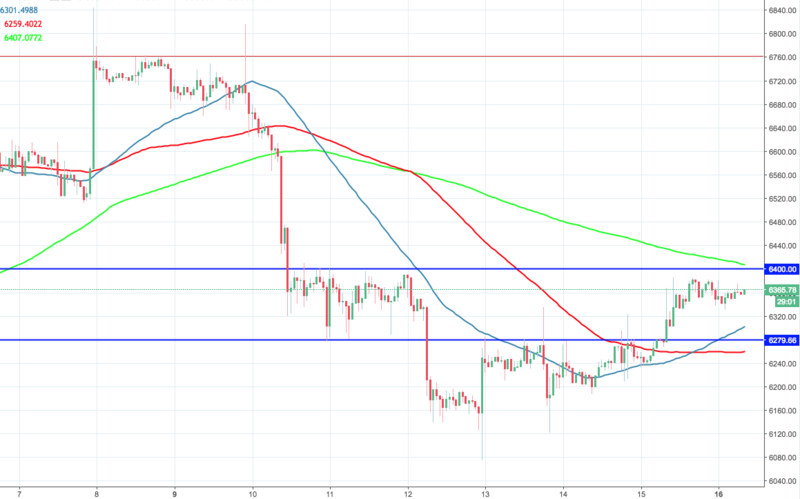 On the intraday level, BTC/USD is supported by $6,300 handle, which coincides with 50-SMA. The next support level comes at $6,276. This is the the lower line of former channel. Once it is broken, the sell-off may be extended towards $6,259 (100-SMA, 1-hour chart). On the upside, the nearest resistance comes at $6,400 closely followed by 200-SMA. A sustainable movement higher will open the way to $6,760 (Fibo retracement level).